When Jean Shim co-founded Silver Lake’s LAMill back in 2008, she helped usher in L.A.’s currently booming third-wave coffee scene. Now, with Rubies + Diamonds, which opened late last year at the new Columbia Square building (formerly the CBS broadcasting facility) on Sunset Boulevard, she’s once again aiming to jolt the city’s café culture. 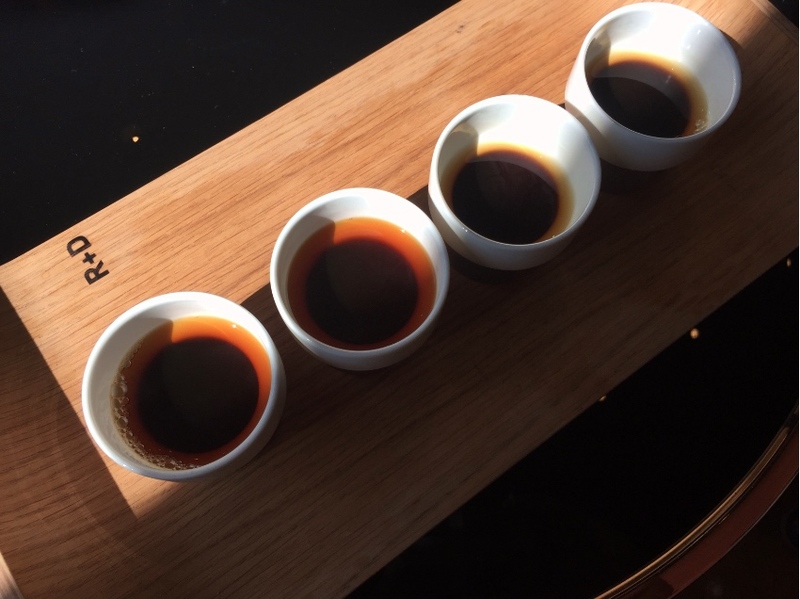 While many coffeehouses try and offer a sizable tea selection, R+D is focusing on coffee and tea equally, and both are being prepared in innovative, and even high-tech ways. Nitrogen infusion, a process that creates a soft, Guinness-like carbonation from the tap, is being applied to cold brew coffee as well as matcha, turmeric, and green teas. “You’ve heard of nitro coffee, and it’s been a cool thing, but we kind of pushed it even further,” says Shim. 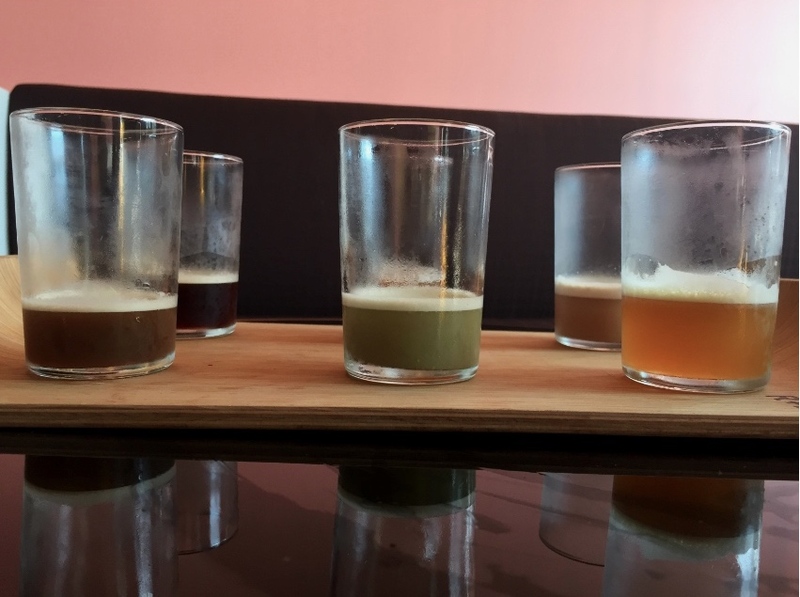 Though the trend is catching on, and nitro coffees are showing up on cafe menus around town, nitro teas are still a rare find in L.A.
Shim is also offering caffeine-rated coffees. Using a system developed by a professional coffee lab, which they’re calling CAF—short for Caffeine Amplitude Formula—R+D’s drip coffees and espresso are ranked on a scale of one to four, with a 50/50 house and decaf blend at the lower end and a full-bodied 100 percent Robusta at the top. “For me, as a consumer, I love to know that when I get a cup of coffee I’ll get that extra little boost in the morning. In the afternoon, I might not want as much of a boost. But, it seemed to me, it was decaf or double espresso or triple shot,” says Shim, who points out that the caffeine levels of a cup of coffee at one shop may dramatically differ from what they’re pouring at another spot. The CAF system was designed to demystify the choosing process and it’s catching on, according to Shim, who says it’s great to see customers adapting to the system and speaking a new language. She also thinks it could go far in freshening up L.A.’s crowded coffee scene. “You’re really changing dialogue and culture of how someone sees coffee in a coffee world that’s saturated,” she says. The fact that Shim is serving coffee made from Robusta beans is also a surprise. Most specialty coffee is made with Arabica beans, which have long been lauded for superior flavor while Robusta gets points for being creamier. Shim says that she made the decision with her roaster, who showed her that proper sourcing and roasting of the less popular bean could yield a nice cup. “We played with roasts and we loved it, and we said this is it,” says Shim. The rest of the menu includes signature drinks that go the unexpected route, like the Smoked Chili Mocha Latte made with a house blend of Republica chocolate and smoked chili brown sugar as well the Misugaru, which combines the traditional Korean grain powder with textured milk. Hot teas are denoted by their purported benefits, from boosting stamina to tummy settling, and there are currently six iced varieties on offer. Foodwise, Shim is working with a few different small producers to stock a selection of pastries. There’s also a hummus that’s being made in house per one of her employee’s personal recipes—it’s served with a fluffy, handmade pita she’s bringing in. Wraps (initially devised by Eric Greenspan), chia pudding, and other grab-and-go options are also available along with Mother Moo ice cream and a small list of beer and wine. Accessibility was a goal for Shim, who says together a coffee and meal averages at about $10. Shim says that experimentation is also an important tenet for Rubies + Diamonds, and while she doesn’t want to overwhelm customers with too many changes, she hopes to keep pushing boundaries with her new venture. “I think if you’re not creative in anything you do, life gets to be kind of a bore, and in our world, it’s always about creating something new,” says Shim. Can This $14,000 Coffee Machine Make Your Beer Taste Better?